Irish Wolfhound dog breed has a history going back to the 4th century, although it may be even older. As with so many ancient breeds, history has been pieced together through depictions of the dogs in artwork or in the few known written records. The breed was treasured for its ability to hunt the wolves that preyed upon livestock, as well as the giant elk of Ireland. The Irish Wolfhound is a giant dog breed. The minimum size for a male is 32 inches at the shoulder and 120 pounds. The smallest a female should be is 30 inches and 105 pounds. The head is long, and the ears are small and dropped. The chest is very deep, and the tail is long. The legs are muscular and feet are large. The coat is hard, rough, and wiry; coat colors include brindle, gray, red, black, and white. This coat needs weekly brushing and may need occasional plucking to stay neat. Prior to choosing a Wolfhound, potential owners should discuss coat care with a breeder. Bred for running with great speed and stamina, the Irish Wolfhound dogs still enjoy running. Since the instinct to hunt is strong, all off-leash exercise should be within a securely fenced-in yard. Although adult Irish Wolfhound dogs are calm and dignified, Irish Wolfhound puppies are very large, silly, clumsy clowns who love to play. An Irish Wolfhound puppy who does not get enough exercise can get into a lot of trouble and be quite destructive. Early training is very important so that the owner can assume a leadership role before the Irish Wolfhound dog exceeds 100 pounds and becomes more powerful than his human. Training should be fair and fun, never harsh. This breed does not do well when left alone for hours each day. Although large and imposing, Irish Wolfhounds are not watchdogs. Adult dogs are good with children, although Irish Wolfhound puppies should be supervised. They are usually good with other dogs but have a strong chase instinct and should not be trusted with smaller running dogs or cats. Health concerns include hip and elbow dysplasia, bloat, heart and eye problems, and seizure disorders. 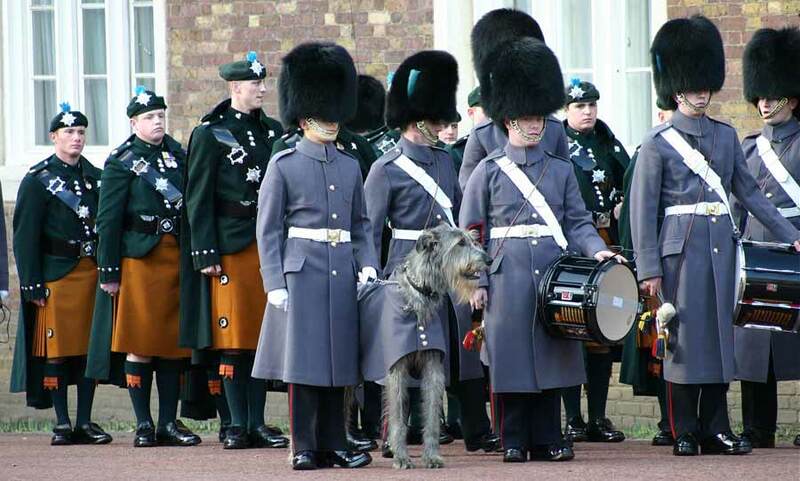 Share your Irish Wolfhound story. 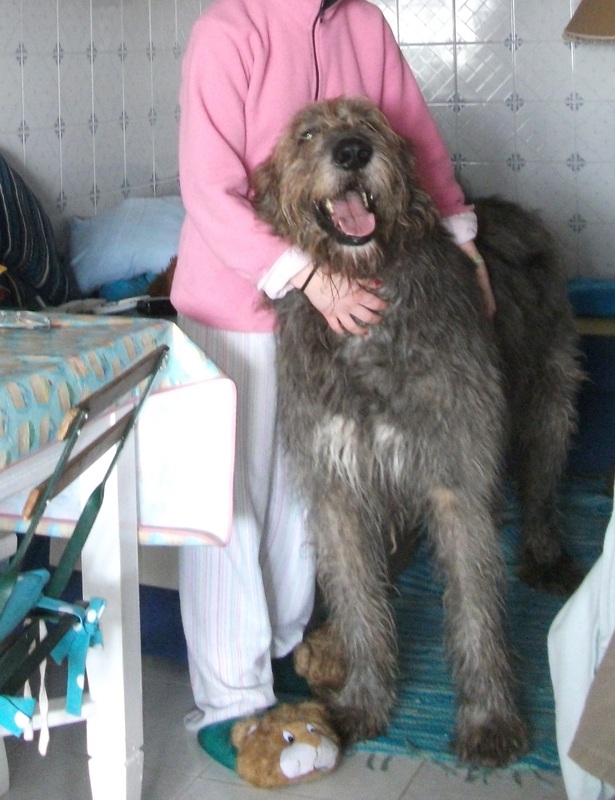 Note: Upload only Irish Wolfhound picture or your picture with Irish Wolfhound below - spammer's ip may be blocked. This gentle giant is sometimes calm and dignified, sometimes playful and silly, always easygoing and reliable. The Irish Wolfhound does best in a suburban or country home with lots of companionship and room to stretch out. He needs regular exercise to stay fit, whether he seems to want it or not. A daily one-hour walk/trot (on-leash) with twice weekly gallops inside a safe enclosed area are necessary for proper development. Sensible with strangers, most Irish Wolfhounds are friendly and expect to be petted, while some are more wary. This breed does need early, frequent socialization to encourage an outgoing attitude. Not many individuals are guardians; indeed, suspiciousness or aggressiveness should never be encouraged because of his massive size. With other animals the Irish Wolfhound is usually amiable, but he does love to chase, tackle, and pounce on anything that moves rapidly. A sweet and sensitive dog, he has his independent side but responds well (slowly and thoughtfully) to patient obedience training. Use positive rewards rather than heavy-handed jerking. Irish Wolfhounds remain gawky, clumsy, and potentially destructive (in a big way!) for up to three years.